This icon represents a Hot Tip! 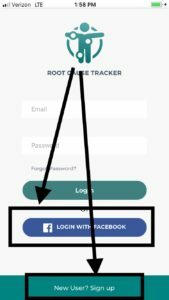 By now, we’re going to assume (and yes, we know about assumptions:-), that you have your Root Cause Tracker safely and successfully installed on either an iPhone or Android phone. Good work. Now comes the fun part…learning how to use it. You start by reading the instructions, walking through a video or written tutorial, learning your way around because you want to use it correctly from the start. EITHER way, you’re good…just know that you’ll save yourself time and probably a bit of aggravation or frustration if you take a few minutes now and read through the following instructions first. After all, chances are you’ve had health issues for quite some time and while we know, from experience, that you want to figure it out as quickly as you can, a few more minutes to learn the ropes will get you headed in the right direction quicker when all is said and done. That being said, if you’re the ‘dive right in’ person, you already dove in and you’re here to figure out how to really use all aspects of the app to your advantage. If you’re the ‘learn first, use second’, you’re in the right place! You can set the app up easily by using a Facebook profile or by clicking “New User? Sign up” at the bottom of the login screen. When you sign up, you are added to an email list that will send you a Welcome to Root Cause Tracker App email as well as some Getting Started instructions in case you don’t read these. We will be using this email list to send you articles, get resources and products that we have either tested ourselves or otherwise fully believe in. You can unsubscribe from this list at any time. In the future, the app will be able to look at your lifestyle choices and symptoms and suggest various information just for you. Unless you Logout in the Profile Section, you will stay logged in so you don’t have to log in every time you want to use the app. NOTE: All of your data is safely backed up on a secure server so there are no issues with losing your data due to a new, lost or stolen (heaven forbid) phone. 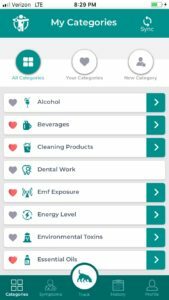 My Categories – This is where you’ll find the individual items that are essentially your lifestyle choices (food, water, EFT exposure, dental work, etc.). My Symptoms – This is where you’ll log your individual symptoms. 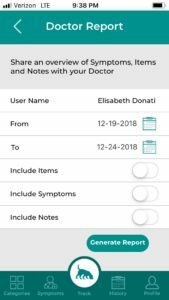 My History – This is where you will see what you’ve logged…items, symptoms and notes, as well as where you’ll generate a report to send to your doctor. 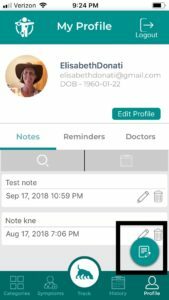 My Profile – This is where you’ll add a photo, edit your profile, add/edit/delete notes, set reminder alarms and add your doctors’ information for reports you’ll generate in the My History section. 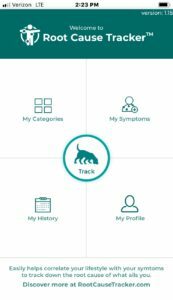 Track – THIS is the biggest section because once you get enough data (at least 3-4 weeks of consistent inputting), you’ll be able to select a symptom or group of symptoms and click TRACK and the app does what it’s designed to do…find links to what you’re doing! To navigate between sections, clicking on the RCT Logo in the upper left of the app will take you to the Start-up screen or click on the section you want at the bottom of the app. 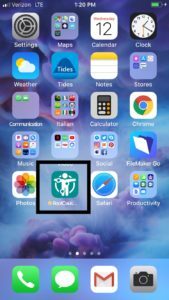 When you’re adding categories, symptoms or notes, depending on the size of your phone, your keyboard screen may obstruct the final dialog box that is designed to complete the task, like the word ‘Add’. Simply click your phone’s Return key to put away the keyboard and access the dialog box. Let’s go over each section now, starting with Categories. The Category section gives you three choices on top. • All Categories – these are the default categories we’ve added to help get you started. • Your Categories – this is where you will log everything about your day that you want to keep track of. • New Categories – this is where you’ll add new categories, sub-categories and items. The first time you log in to Root Cause Tracker, it will take you to ALL CATEGORIES so that you can begin to customize the categories you want to track every day. The Category section is broken down into Sub-categories and then Items which are the things you will actually track, e.g., banana, red wine, had a tooth pulled, etc. To choose your initial Categories, simply scroll through the default categories, noting that you access the Sub-Categories by clicking on the green arrow on the right of each main Category. You will choose Categories and Sub-categories by clicking the gray heart beside each in order to make it red. You can click on the green arrow on the right side of any Category to display the Sub-categories and only HEART the Sub-categories you want to track. Notice that if you only choose a few sub-categories, the heart next to the main category doesn’t turn red. NOTE: I suggest starting with just a few categories at first because otherwise you’d be glued to the app all day long and that’s just not a healthy thing to do! If there is a Main Category or Sub-Category you don’t see that you suspect might be causing issues, simply click New Categories and add it. To add a Sub-Category under a Category, simply choose the parent category you’d like it under. Any category you add will automatically be added to the Your Categories section and will have a red heart on it in the All Categories section. NOTE: If for some reason a new Category, Sub-category or Item doesn’t show up automatically in Your Categories, go back to All Categories, search for it and click the heart. There is also an option for adding a Note in the Add Category section for any date and time you wish. Simply click on the little green circle with the notepad icon on it. You can add and edit Notes in the Profile section as we’ll see later. You now have Your Categories set up to start tracking Items. You can, at any time, go back to add, delete or modify the Category section to make it list everything you want to track. There literally is no limit to what you can track. 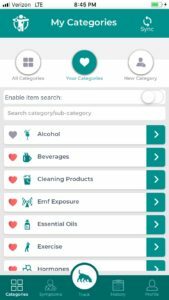 NOTE: Adding Items to both your Categories section and Symptom section (see below) are the key to making your Root Cause Tracker work. The App has to have enough data to do what it’s supposed to do…track the connections between what you’re doing and how you’re feeling. You must find a way to make inputting what you’re tracking a priority. AND, since you went looking for a way to find more answers for yourself and found us, you’re already the type of person whose health is a priority! Good work! There are two ways to find and add Items to your daily intake data. Both methods require you to be in the Your Categories section. Click on the name of the main/parent Category and every Item that is under every Sub-category will be listed (if there are items listed). Some Categories are completely personal so there may not be any items there yet. You can scroll to find the item or type/dictate the item into the Search Bar and it will come up if it’s there. Simply click on the square and click ‘Add to Intake’ on the bottom right. If the item you’re looking for isn’t there, click the big + (plus) sign in the upper right and add it. To be more specific for categories with lots of items (like Food for example), click on the green arrow to access the Sub-categories section and then click the Sub-category where you know the item lives. Again, check the box and click ‘Add to Intake’. Regardless of how you get to the Sub-category section, you can always add a new item (like a new food you tried) in this section by clicking on the large plus + sign in the upper right. It will automatically go into the Sub-category you’re already in. NOTE: Many times you won’t be logging the information at the time as the item occurred (ex: logging what you had for breakfast at 11 pm that day). Simply change the day/time by clicking on the calendar icon to the left of the Add to Intake button. NOTE: Remember that you are not adding quantities of Items; we are only adding the Item itself. However, if you wish to add quantities, then add specific quantities of Items in the Add Categories section. Once you have ‘hearted’ the Categories and Sub-categories you want to track (and you can go back and change/add/delete at anytime), and looked at the Items under the Categories and Sub-categories, you need to set up the Symptoms section. NOTE: The app is programmed to notice what Items you choose often. When you’ve chosen the same item more than three (3) times, you’ll notice that Item comes to the top of the list and is no longer in alphabetical order. 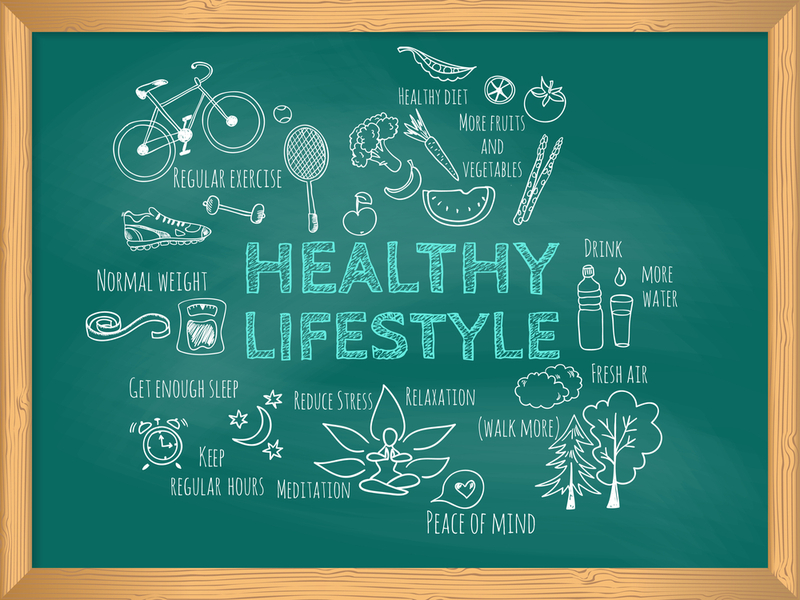 As the name implies, this is where you’ll log the physical, mental and emotional symptoms you want to try to link to your lifestyle choices. You can access the Symptoms section by clicking on the RCT icon in the upper left which takes you back to the Start-up Screen or simply click Symptoms on the bottom navigation menu. All Symptoms – a default list of symptoms we’ve added to get you started. Feel free to organize your symptoms any way that makes sense to you. Your Symptoms – this is where you’ll actually log your symptoms each day. 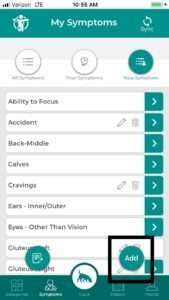 Add Symptoms – This is where you’ll add new Symptom types and actual Symptoms to track. 1. The main broad symptom category. 2. The actual symptom you want to track. You can lay this section out virtually any way that makes sense to you and in whatever detail you wish. We’ve added many default main Symptom categories but if you’d rather track a symptom under a new main list, simply add it in the Add Symptoms section. 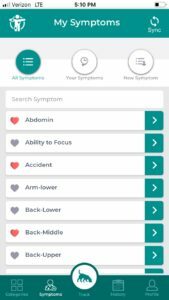 The first time you go to the Symptoms Section, the app will take you to All Symptoms (see Image S-1) so you can choose the symptom areas you want to track by clicking on the red heart next to the broad symptoms list. If you want to add a new broad symptom type, just click on the New Symptom circle on the upper right (see Image S-3). Click the Add button on the right to add either a Broad Symptom list or the specific Symptom you want to track. Again, you can choose the broad symptom you want a symptom item under or add a new main symptom list first and then add the symptom. It’s totally customizable based on how your brain processes information. You can also add an actual symptom item by clicking the large green plus + sign in the upper right when you’ve clicked on the broad symptom category in Your Symptoms section (see Image S-2). You can click anywhere on the bar of any main Symptom list and it will open up into a list of actual Symptoms. Simply check the box, make sure the date and time are correct and click Add to Intake. Click the Green Arrow to the right of any main symptom list and all of the actual Symptoms will drop down so you can check and click the big green plus + symptom. Again, you can literally keep track of your symptoms in any hierarchy that makes sense to you. When you add a main Symptom list and then actual Symptoms through the New Symptom list, you’ll click the Add circle, select a main Symptom list item if one makes sense to you and then create the actual Symptom under it and click Create. 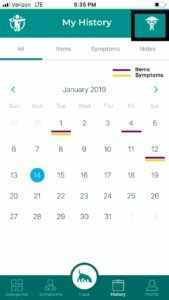 After you add new symptoms, it should automatically be in the right section in the Your Symptom section so you can easily click and add it to your day. The My History section of your Root Cause Tracker app is pretty cool. It shows you the items and symptoms you’ve added to your daily journal, and any notes you added for any day you choose. 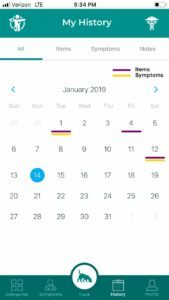 In addition, we’ve added the ability for you to see on which days you’ve added Items or Symptoms and which days you haven’t. The nice thing about this page is that while we all want to be the most perfect little journal keepers, life will get in the way and you won’t remember to log meals or symptoms or anything else on a particular day. No worries. We’ve got you covered! All you have to do is go to your History section and see which days have no lines under them (see legend on app). The current day has a blue circle around it in case you somehow go through a time warp and don’t remember the day…hey, it happens! This is where you’ll create a report to email to your doctor with a list of your items, symptoms and notes for whatever date range you choose. How many doctors have asked those of us with health issues to journal what we do and our symptoms and then send it to them in a readable, organized fashion? They are going to thank you! Simply click the Medical Insignia in the upper-right hand corner of this screen. This takes you to the Doctor Report screen, which looks like this screen to the right. Using the calendar icons on the right, select your From Date and To Date. Then choose what to include in your report: Items, Symptoms and Notes. Sending your doctor a report. Click Generate Report below and the app creates a preview of your report for you to see. Next, click on the Email icon in the upper right, choose your doctor, click the Email Icon at the bottom of that screen and your report will open up into a new email. At this point, you can customize what you want to say to your doctor and send it off. Now isn’t that fabulous? We hope you think so because we love this feature! Add a Note about anything you wish to track here by clicking on the notepad icon on the bottom right of this section. It’s important to be able to add Notes about certain things, ideas you have, etc. at any point while you’re tracking things. You can edit and/or delete Notes any time you wish from Your Profile section as well as in the Add Category and Add Symptom sections. Add a Reminder by clicking on the Alarm Clock icon on the lower right of this screen. Give your Reminder a title, choose the time you want it to go off and how often you want it to repeat. Set it and forget it. Well, set it and be reminded I guess would be a better slogan. You can edit or delete Reminders at any time. 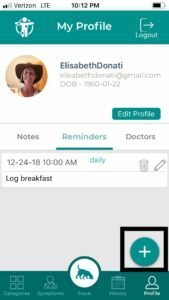 This feature is important because you can send yourself reminders to add your meals, exercise, medications, and more. You can set a reminder for virtually anything…when to take a supplement or drug, when to sit and meditate for a few minutes, etc. It’s not as it we need our phones telling us what to do, however, getting a little nudge to add the items you’re trying to track is probably a good thing…especially if brain fog or memory issues are a problem for you. Keep a list of all of your doctors/health care providers in one spot and even add notes to their names. Generate a report of all Items, Symptoms and Notes that can be emailed to any doctor at any time for any time period. How many times has your doctor asked you to journal or keep track of what you’re doing in order to help you figure out what may be causing your health issues? Your Root Cause Tracker app not only makes it easy to track anything you want, anytime you want and customize it exactly the way you want, it also gives you a quick and easy way to send this information to your doctors. NOTE: You will actually generate reports in the HISTORY section, not in the PROFILE section. Okay, there you have it…a pretty detailed rundown of your Root Cause Tracker app, how to use it, what’s involved, how to get the best from it (use it daily!) and more. Like most things in life, you get out of them what you put into them. The app has to have data, and plenty of it, to help you so the best thing you can do is commit to a time frame, like 30 days or 60 days, to input as much as you can each day and you’ll have a much better chance of discovering what’s happening in your sweet body. Remember, your body isn’t failing you…it’s trying to protect you and your symptoms are wakeup signals that something’s up. If you need health coaching, we can help. If you need to order your own lab work, we can help you. Or if you just want to talk, give us a call at 805-637-7888.